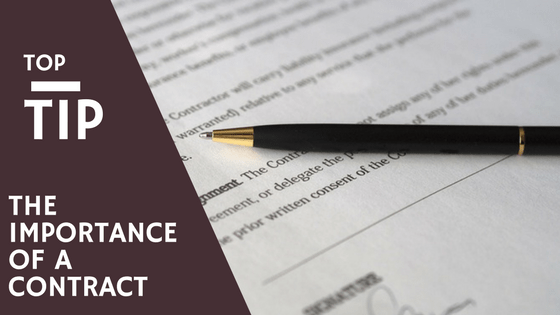 Contracts – what can seem a pain to put together can save you time and money in the future. Recently RedRite have had a handful of our associates and colleagues ask about our stance on contracts and the importance they hold for small businesses, particularly ones who provide a service. We believe that no terms of service should start without a sign agreement and Terms & Conditions – Personally we require all clients to sign a ‘Sign Up’ sheet accompanied with the Terms and Conditions before we will do any work for them. This way we are protected in case they choose not to pay and the client is protected if we do not provide the work promised. I cannot count the number of times someone has said to me ‘So-and-So client has not paid and now won’t return calls or emails. I am now out of x-amount of money’ when asked if they had a contract the typical answer is no! They fear that they have no standing in court because of this lack of a contract, however this is not necessarily true but matters are easier if there is a contract in place. Why is a contract important? Contracts provide a written document that outlines the full understanding of the business relationship and scope of the work so that no one can claim any misunderstandings later down the road. Contracts can minimise the risk involved in business and are legally enforceable. They should stipulate how and when you get paid, what needs to trigger that payment, and what recourses you have if the client stiffs you. On our contract we do not stipulate exactly which service is being provided as we offer a variety of Virtual Assistant services and our clients’ needs are constantly changing, however this is a personal choice and your contracts can be written how you feel comfortable. We do provide all clients with an email that covers what services they are initially interested in as well as the cost for this in which they then must accept. If at any time they choose to change their services in any shape then we will again follow this up with an email requesting acceptance of the services. Their responding acceptance of the emails are then filed with the contracts for future reference in case a client ‘forgets’ what it is they agreed to. What should a contract include? A typical contract requires both party’s names, contact addresses and numbers – we include email addresses as well – and the starting date. An ending date is not necessarily needed unless there is a time frame on the period in which the services will be provided. If you wish to specify exactly which services the contract covers then they need to be clearly stated also. A copy of a legally correct Terms and Conditions must accompany it so the client is aware of exactly what they are agreeing to. You do not need a lawyer to write up Terms and Conditions, many versions are available online as long as they apply to your business and the different clauses do not contradict each other (this can make a contract invalid). If there is some terms you and the client agree on outside of your standard contract these need to be included as well and initialled by both parties. If you are handling customer data there must be a Data Protection clause included (You can register with the Information Commissioners Office to provide additional confidence within your business – As long as you abide by the laws). We highly stress including a termination clause as well which will include any notice periods, termination fees and anything else that you would like to happen when a client or yourself choose to terminate the contract – this is something you do not realise is necessary until too late. Contact us today if you need help with your contracts.